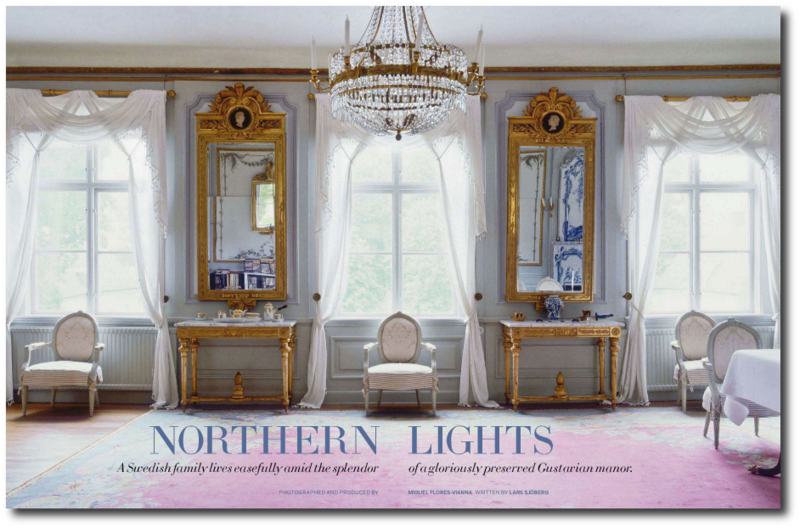 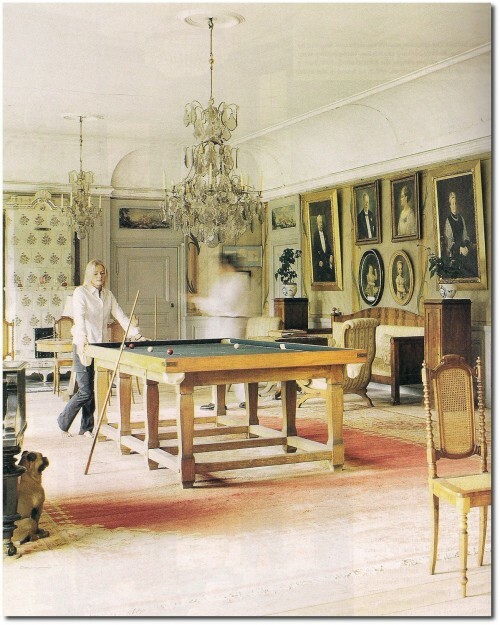 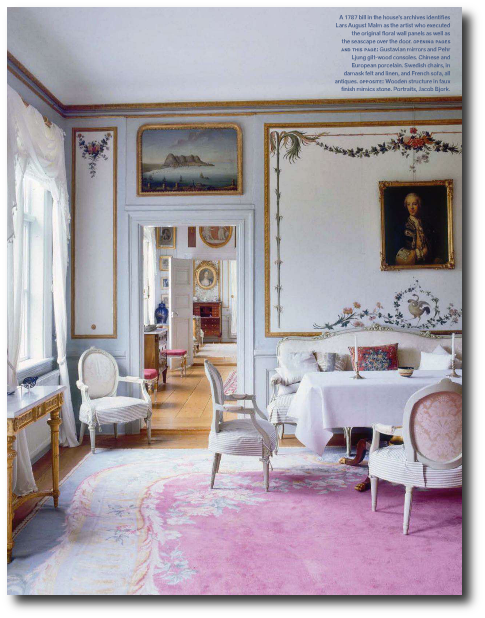 I have been holding on to Veranda’s November / December 2011 issue which featured an 18th century manor situated in Sabylund, 2 hours west of Stockholm. 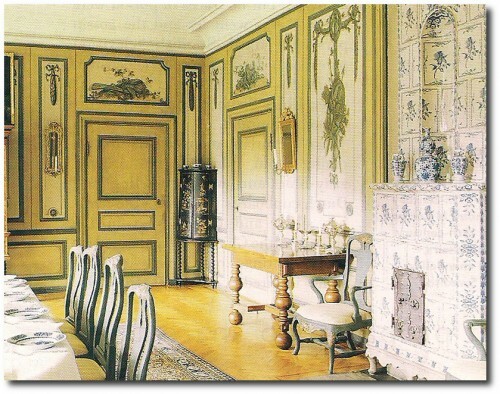 Built in 1780’s in the Gustavian aesthetic, the house has stayed virtually intact as it was back in the 18th century. 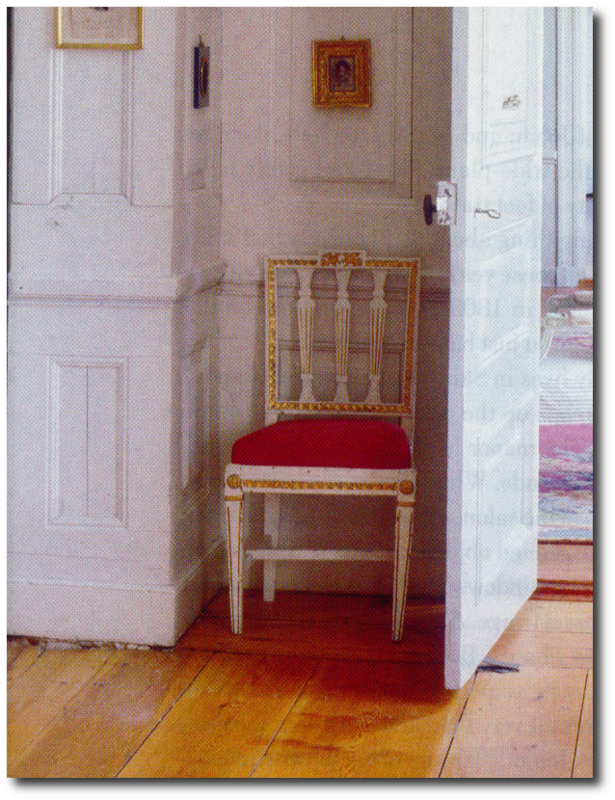 In the red room, chalky white finished chairs with gilt wood embellishments are covered in Chinese red damask. A Swedish day bed functions as a sofa and a bed, and is accompanied by a table surrounded by Gustavian white painted chairs. 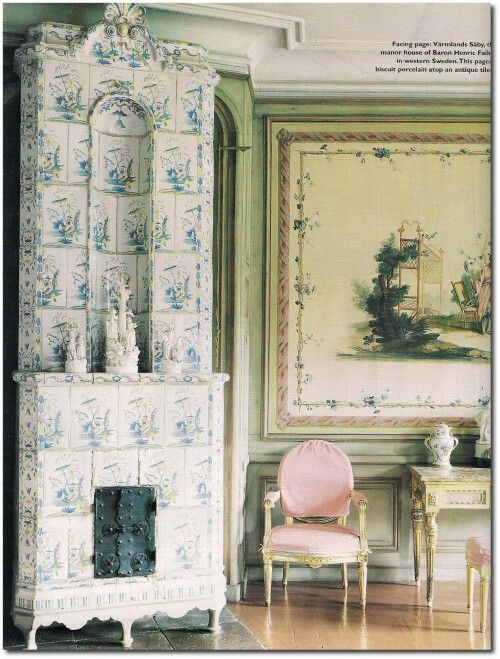 A Swedish Kakelugn stove has gold painted garlands on the tile. 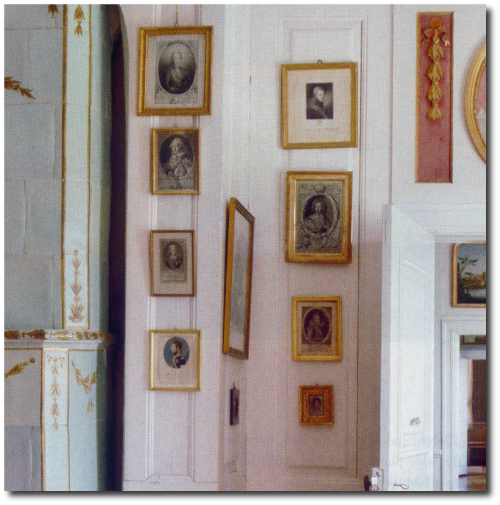 A number of small rectangular portraits hang on the wall. In the main room, light blue painted walls are framed with wall moldings, and hand painted garlands add a romantic feel to the walls. 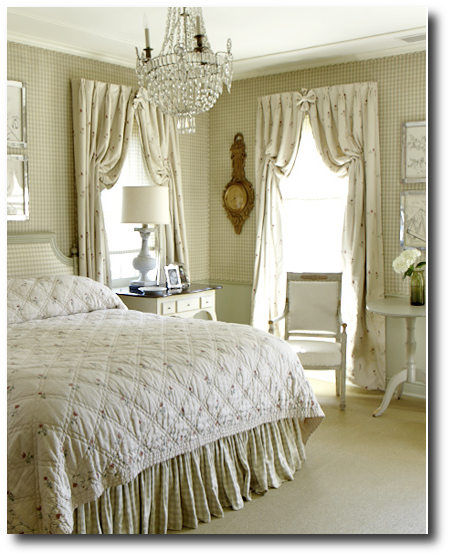 Sheer drapery allows the light to come into this room. 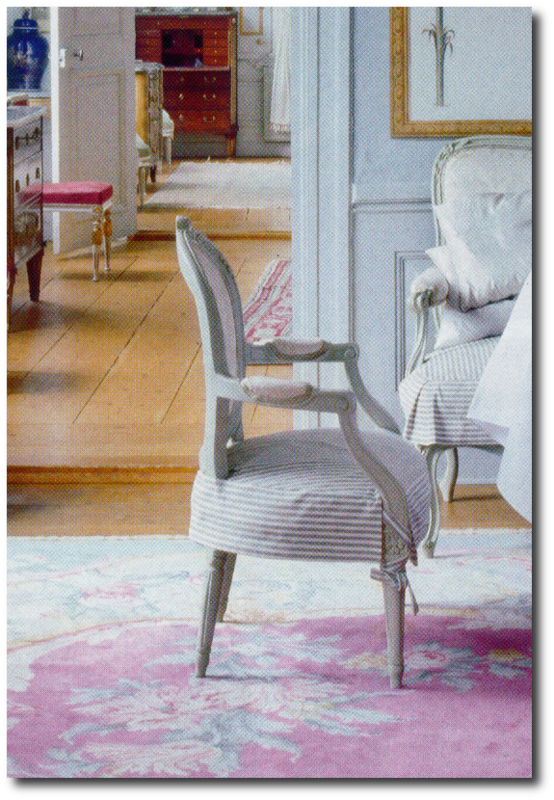 A settee and Louis XVI chairs with a blue and white stripe slipcovers form a seating area with a Empire table and crisp white tablecloth. 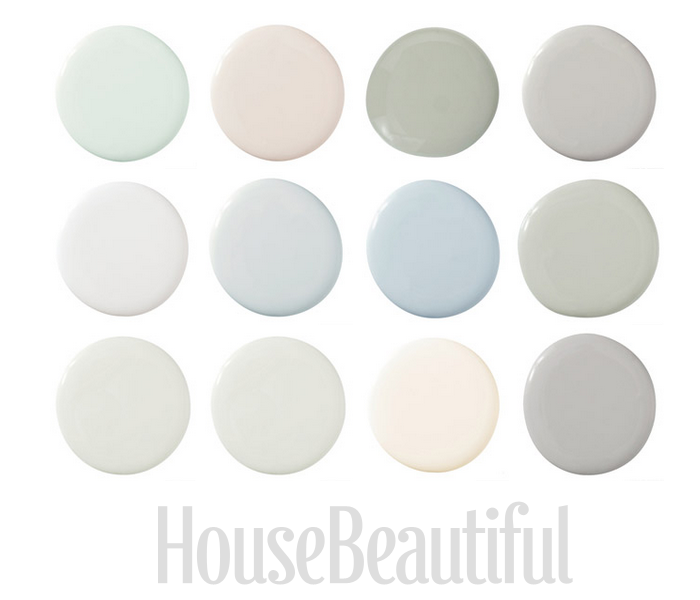 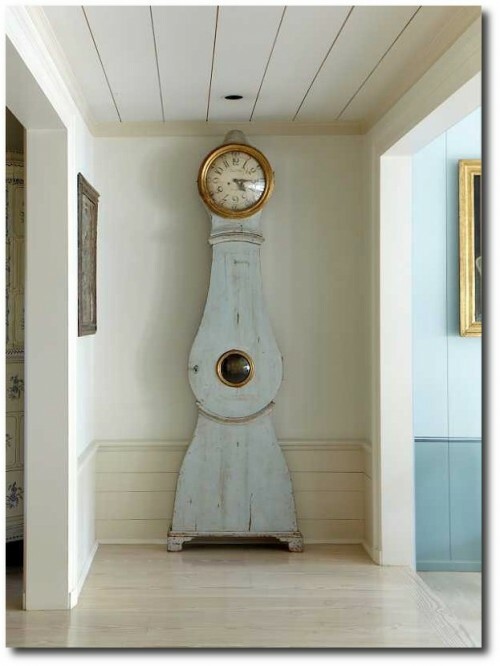 A pale light blue and white scheme pull together a soft, yet delicate look for this room. 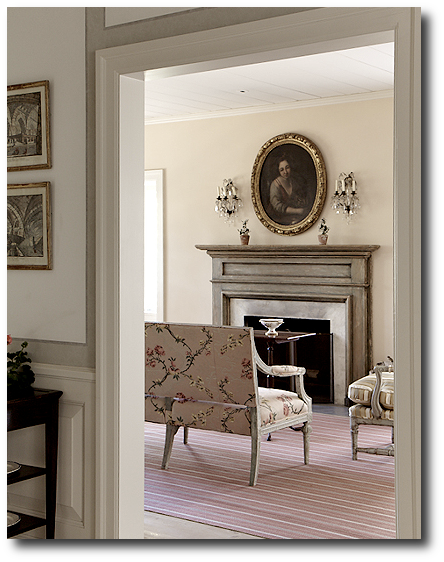 A pink rug, and lighter pink upholstery seen on the backs of the chairs offer up a subdued, yet tender room to lounge in. 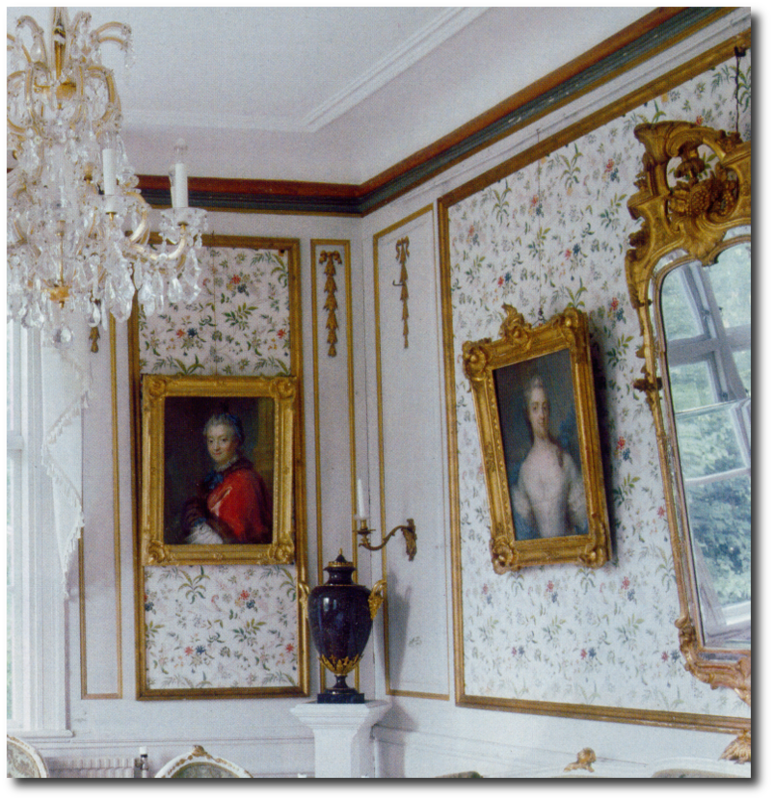 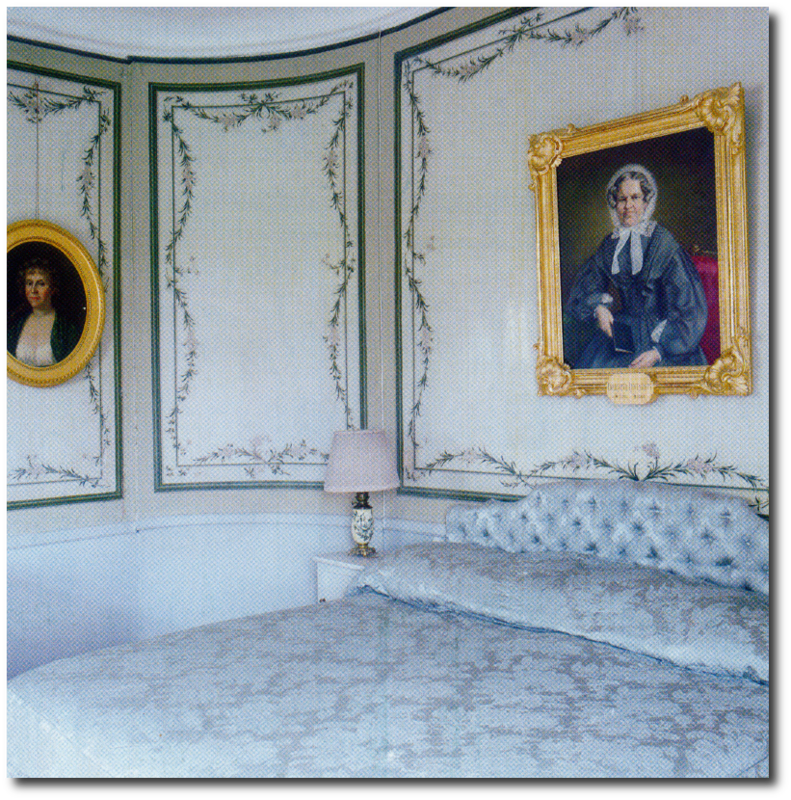 Large gilt oval portraits add a historical feel to the room. 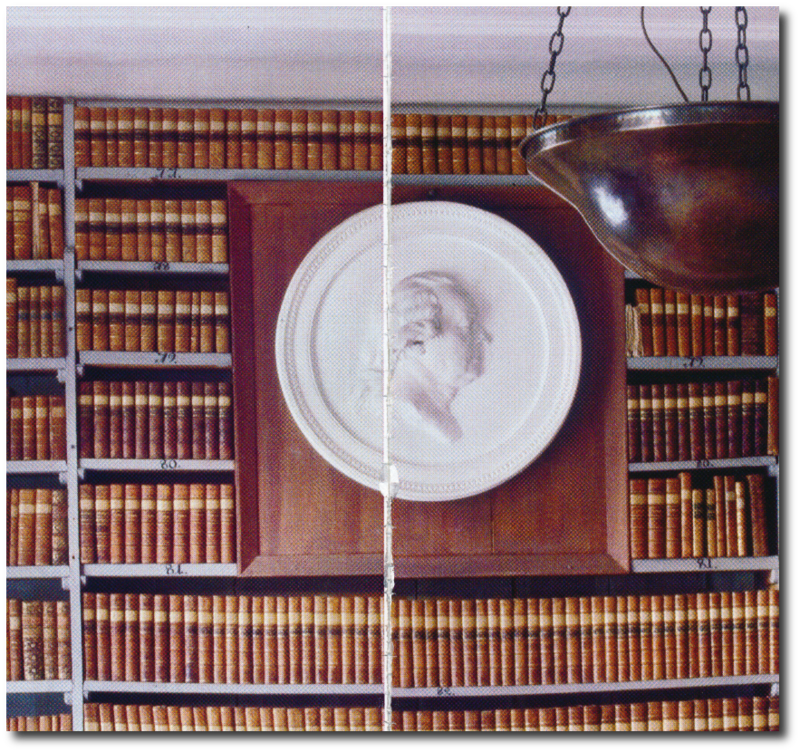 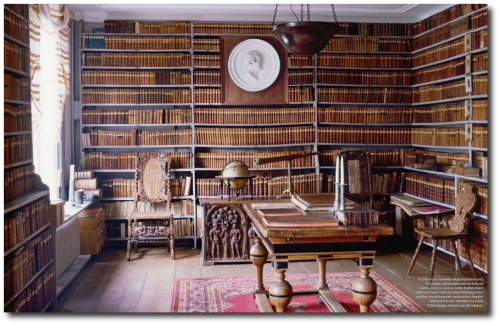 A grand library filled with the owners original books offered a taste of the high life. Books were so much more valuable in the 17th and 18 century, and having a library filled with them, suggests the owners were well off. 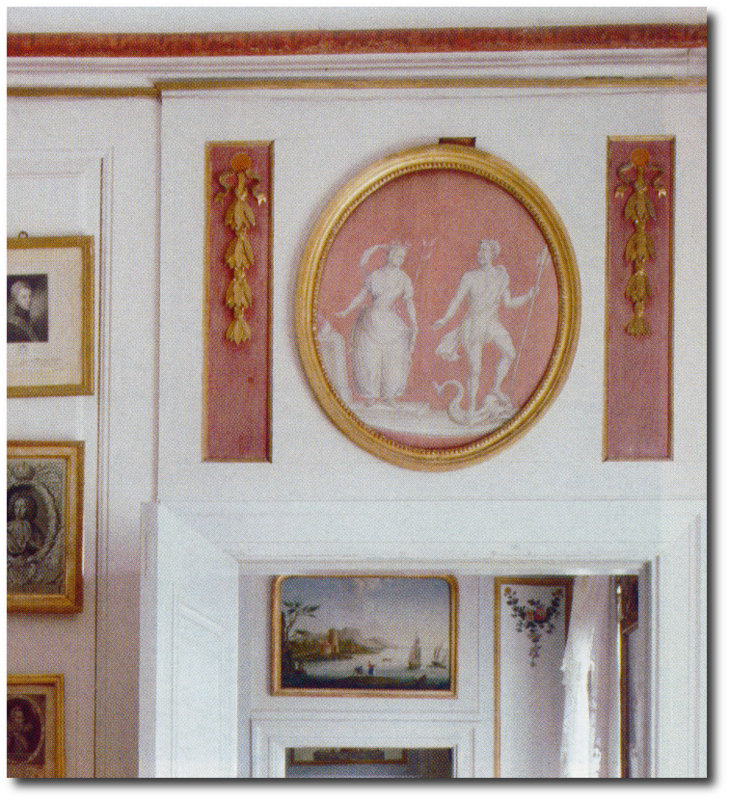 A 1799 white stucco medallion mounted on a simple wood frame depicts the houses first owner. 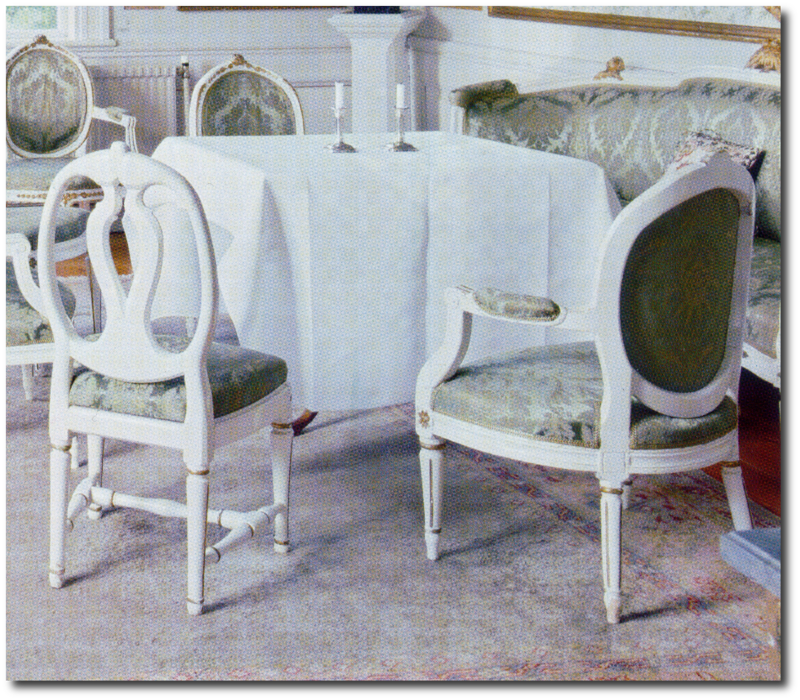 A Dutch or German table centers the room, with English cane chairs backed to the books. 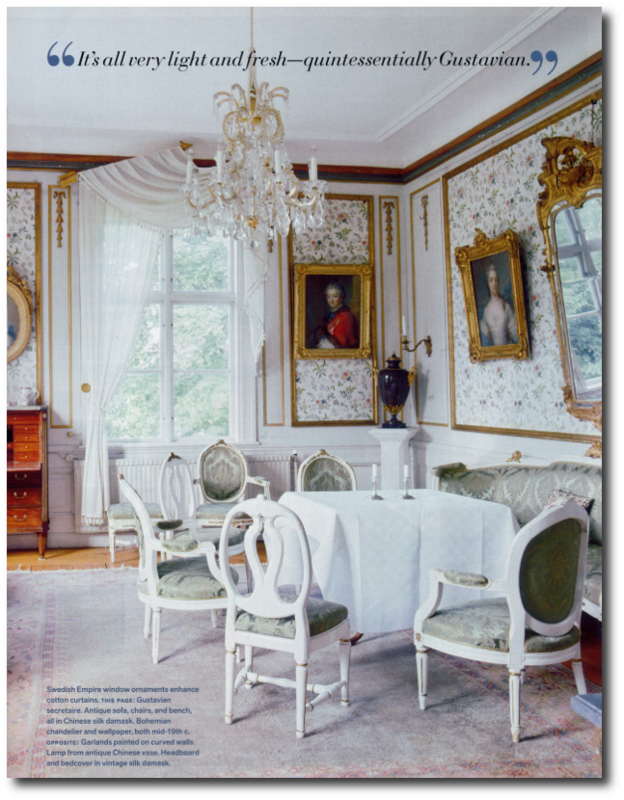 Swedish pewter candlesticks sit on the table, along with a brass telescope for viewing nature. 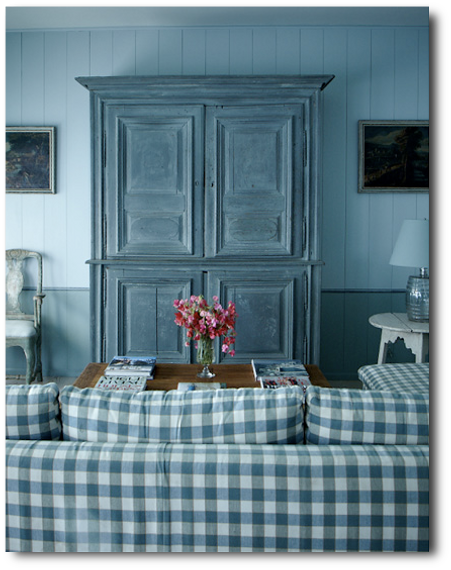 The shelves are painted in a blue/ gray, houses natural leather books adding such rich contrast. 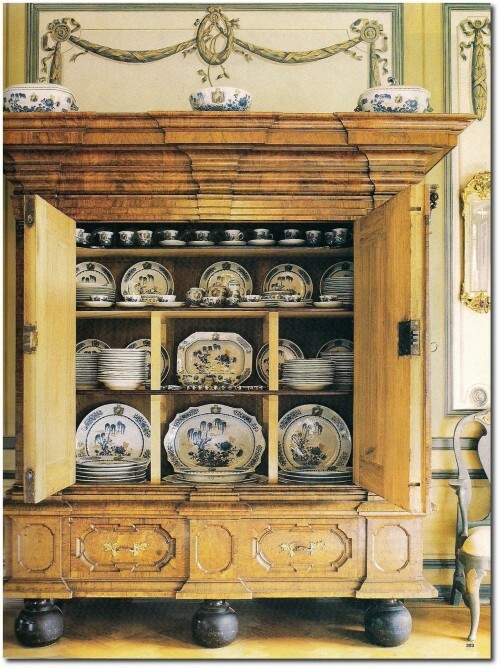 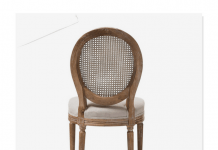 Furniture is left in it’s natural wood, which adds a rustic effect. 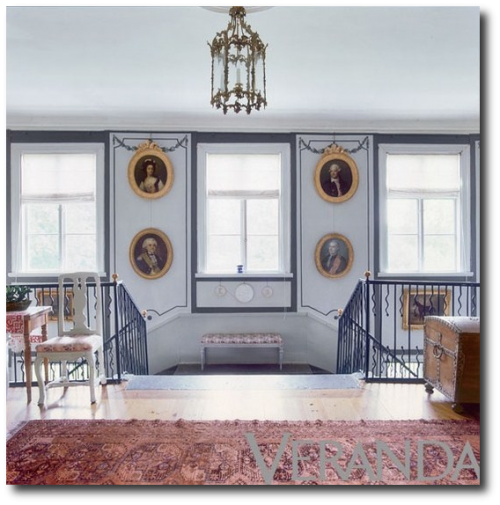 “The most interesting thing about this house is that it has actually been lived in all these years” says Johan who owns the house. 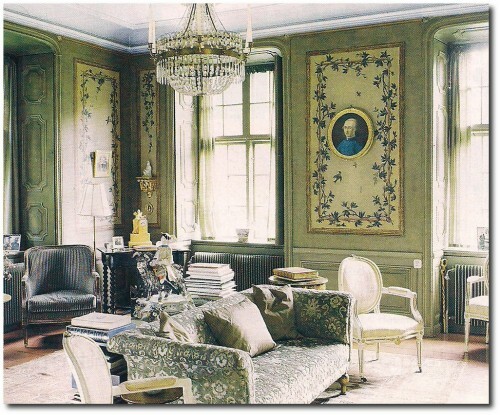 His wife Ingrid Lagerfelt and their two children live in this home currently. Their ancestor inherited the house from the original brother and sister who built the home. 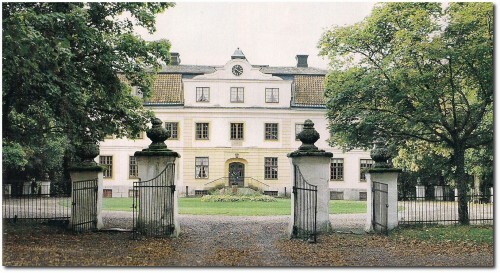 Johan is a doctor, and his wife Ingrid farms the estates 2,500 acres of land. 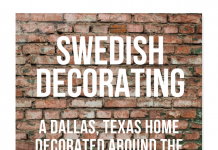 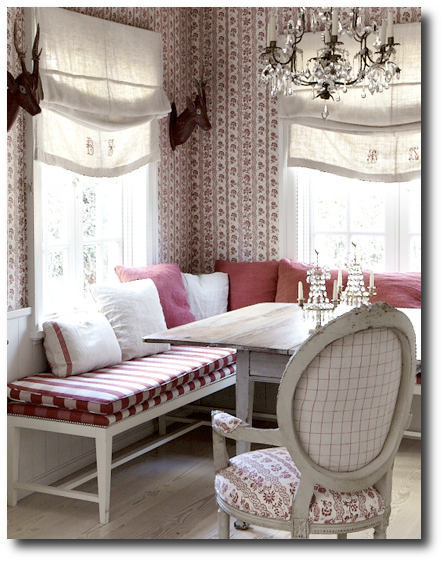 House Beautiful first captured our interest in this Swedish styled home decorated by Carol Glasser and Katrin Cargill. 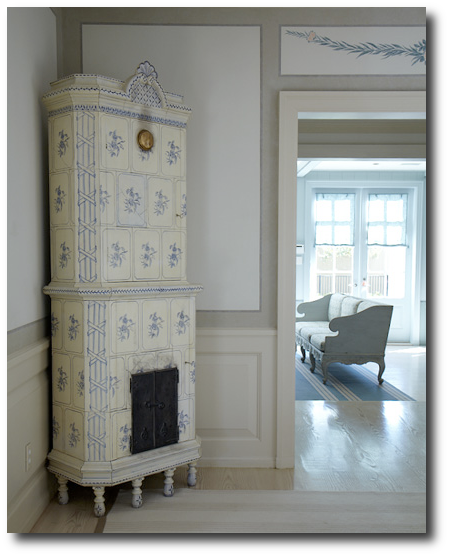 The home bathed in blues with Swedish-style home by Carol Glasser Interiors. 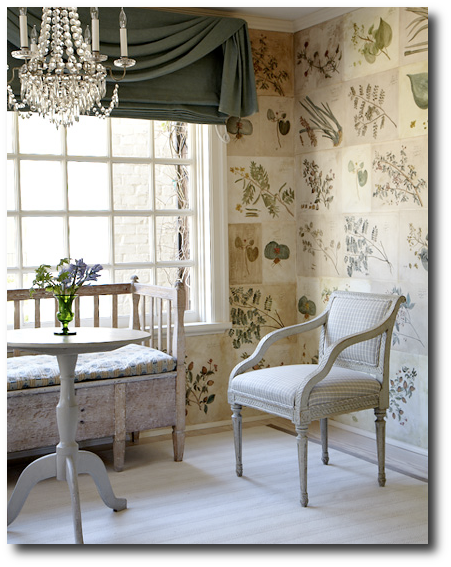 This home was originally decorated around an English country style, and featured in Country Living magazine in the 1990’s. 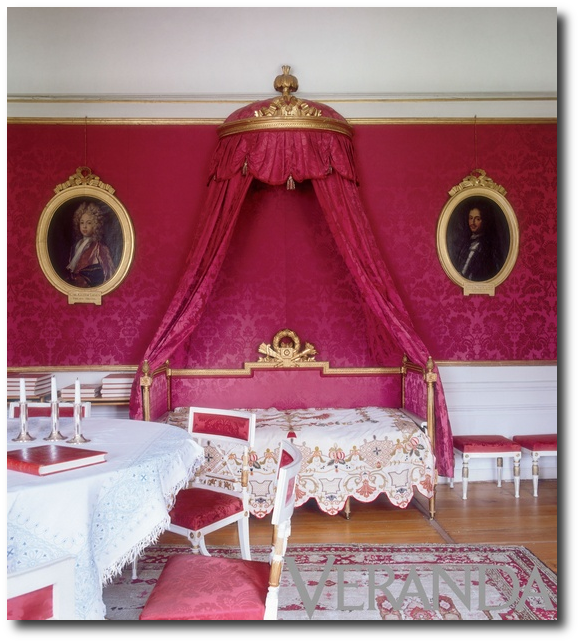 Later the homeowners decided their taste had changed, and they wanted an 18th century look focused on the styles found in Sweden. 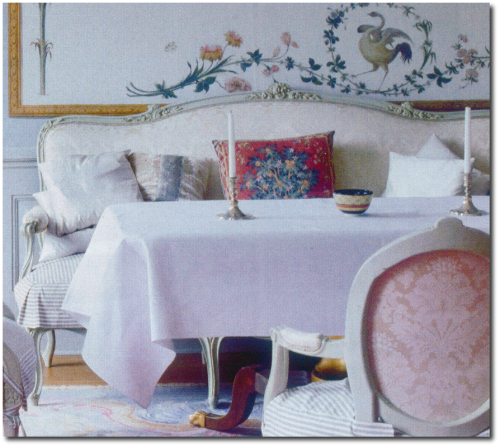 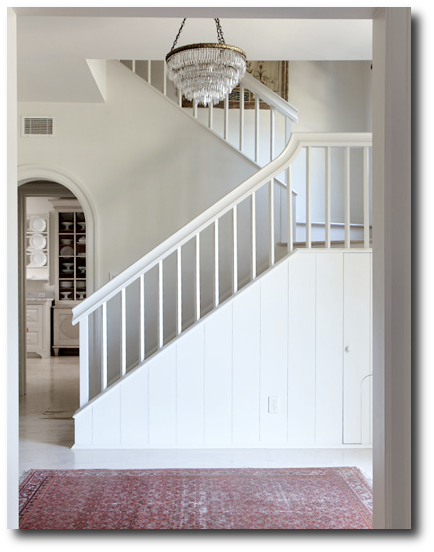 To start this process, everything in the house was sold, as they started the process of decorating their home, completely from scratch. 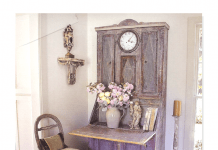 It wasn’t just a change of furniture and a little bit of paint, but rather the house’s walls were taken down to their studs and every thing was given a new facelift, -the roof, floors, windows and walls. 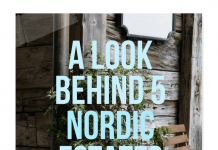 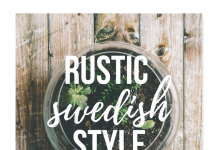 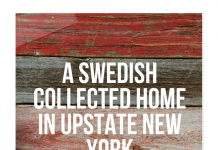 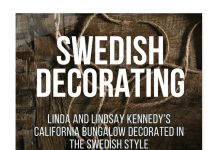 Carol Glasser decided to work with Swedish Style expert Katrin Cargill who brought the eye for authenticity. 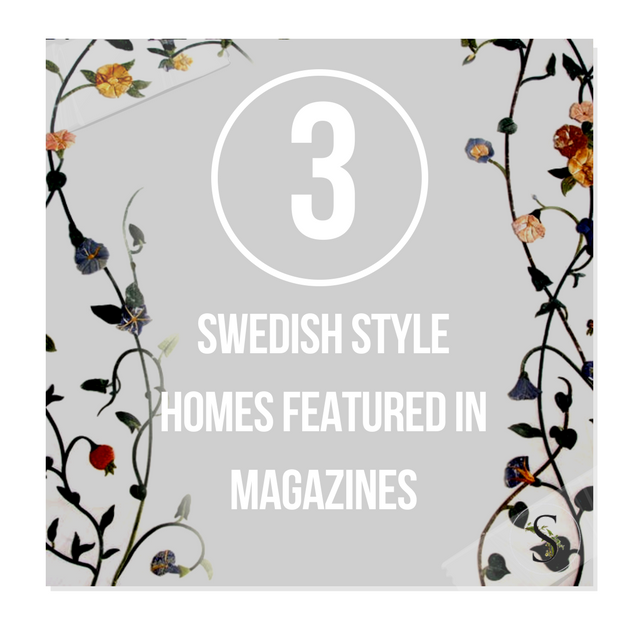 In the living room sits a classic style Swedish painted sofa, while on the other side of the room gives the room a modern twist with a Charles sectional from B&B Italia. 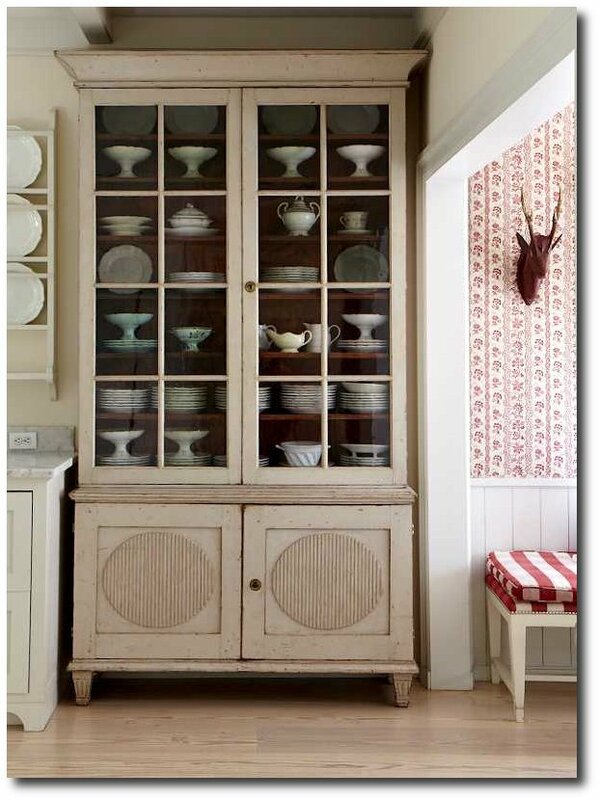 Walls show off a rustic look with painted planks with a faux chair rail. 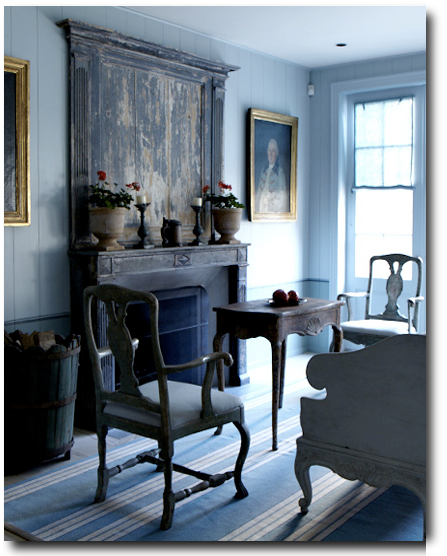 Antiques in this room are beautiful in their original paint. 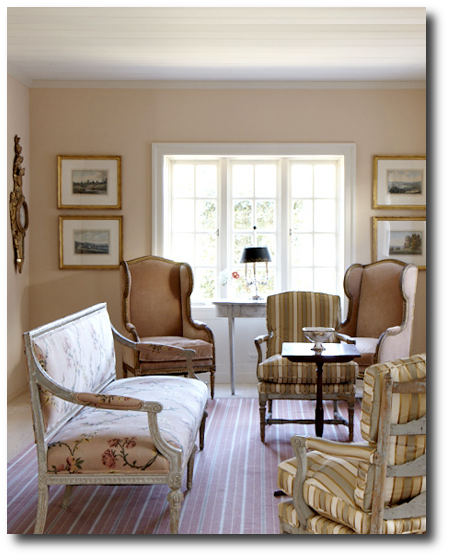 A French Directoire mantel and Swedish tea table and armchair make the perfect 18th century sitting area. 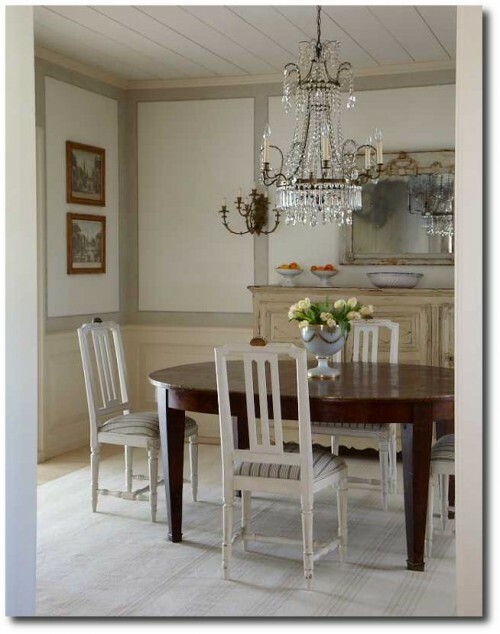 These pictures came from Katrin Cargill’s website and are updated shots of the home. 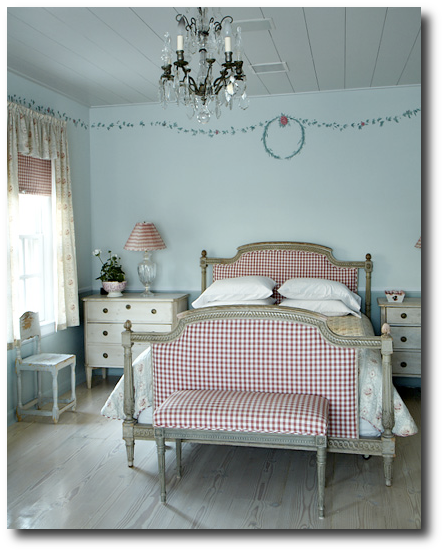 Swedish-style home by Carol Glasser Interiors. 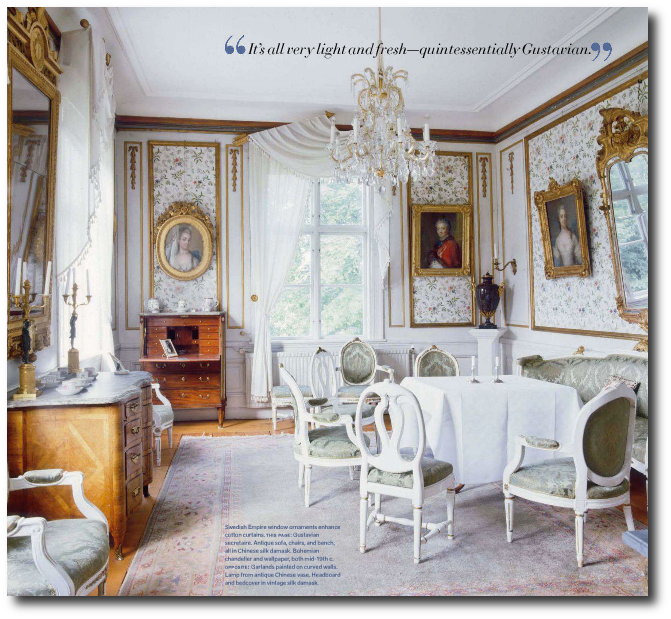 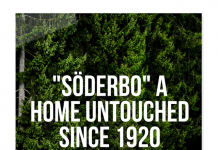 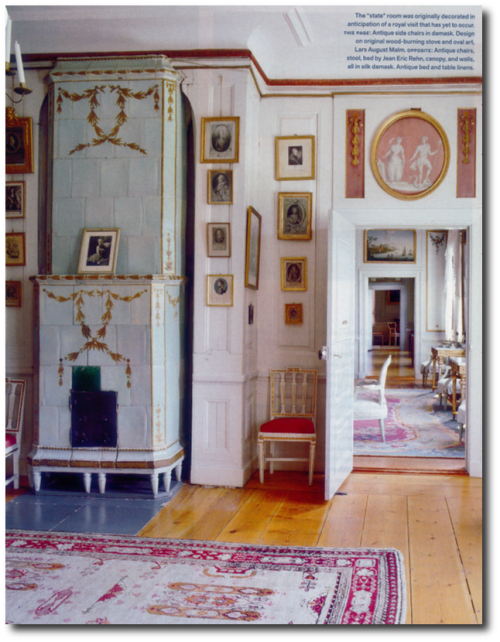 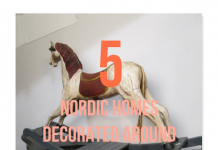 The Devoted Classicist featured the country manor home of Baron Henric Falkenberg, which is located in western Sweden on the shore of Lake Vanern in Varmland province. 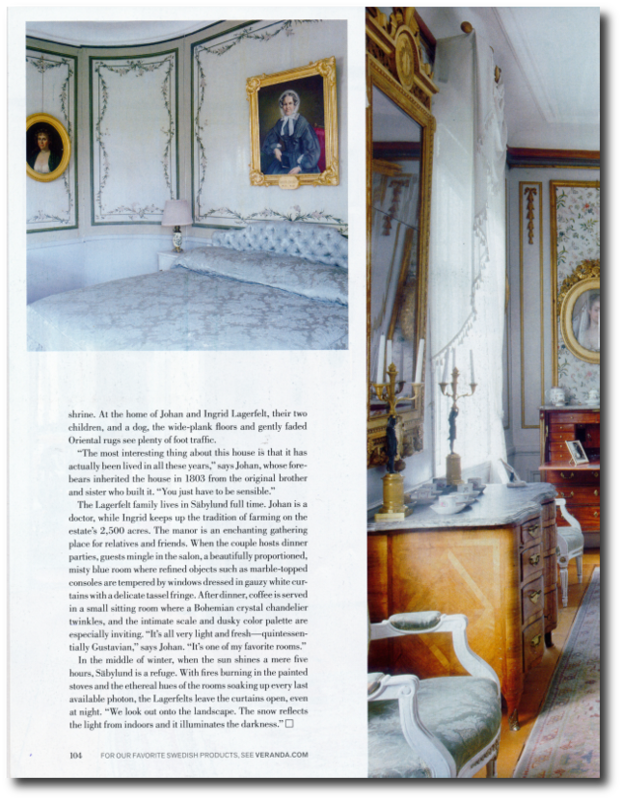 The property was featured in an article by Miguel Flores-Vianna with photos by Fernando Bengoechea in the April, 2000, issue of Elle Decor magazine.